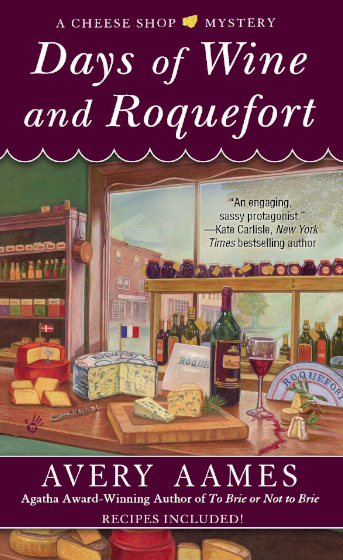 Killer Characters: Do you remember the Days of Wine and Roquefort? Do you remember the Days of Wine and Roquefort? DAYS OF WINE AND ROQUEFORT! “Get a move on, Charlotte Bessette,” I muttered. Time and I were not fast friends. On any given day, I felt like I was behind. Rags, my sweet Ragdoll cat, twitched his tail and meowed, the little taskmaster. When my cousin Matthew and his twins moved out a few weeks ago, I made a pact with myself to refurbish each of the rooms in my Victorian home, one at a time, after work at Fromagerie Bessette and on weekends. I had a to-do list so long that it would make an obsessive person nuts. Me? Okay, I was nuts. Seeing as many tasks were going to be messy, I had decided to convert my rarely used garage into a workshop. But before tackling the job, I needed sustenance. I stood in my kitchen preparing an appetizer that was fast becoming one of my favorites: Charlotte’s Nirvana. To make the appetizer, I chose a sliver of an heirloom tomato, a hearty slice of San Joaquin Gold, which was a buttery, Cheddar-like cheese, and a portion of prosciutto. I stacked the trio on top of sourdough slathered with homemade pesto and cut it into bite-sized pieces. I popped one into my mouth, set the rest on a platter, covered them with a checkered napkin, poured a glass of water, and with Rags trailing me, traipsed to the garage . . . workshop. The space teemed with books and boxes filled with discarded clothing bound for the homeless shelter. My mountain bike and cross-country skis­--neither used in well over a year--hung on the wall. A sizable wine cooler that contained nearly sixty bottles of wine, all recommended by my savvy cousin, stood in the far corner and hummed with energy. I set the snack on a red metal cart that held my tools, then pushed everything from the center of the garage to the sides and laid out a tarp. Cool air whistled through the opened windows and the pedestrian door to the garage, but I was too revved up to care. I moved the Tiffany desk lamp, Chippendale side tables, and antique desk from the office to the workshop with the help of a dolly. Matthew had promised to help me repaint the office; meanwhile, I intended to repair the furniture. Rags paraded beside me. He tilted his chin with curiosity. The secretary desk was first on my makeover agenda. My great-grandfather on my mother’s side had purchased the desk in the early 1900s. Sometime between then and now, someone had given the desk a coat or two of murky brown paint—why was beyond me. Intent on restoring the desk to its original beauty, I set a can of stripper and stack of sanding paper on the tarp. Next, I donned a pair of gauntlet gloves to keep my hands from becoming shoe leather, and I strapped on a pair of goggles. Using a power screwdriver, I disassembled the desk. I placed the organizer cubby, carved legs, and dovetail drawers on the tarp, and then eyed the desktop. “I’ll sand the belly first,” I said to Rags. He mewed his assent. Carefully balancing the desktop against my legs, I flipped it on its edge and lowered it to the tarp. As it landed, dust poofed into the air. When the dust settled, I spied a hidden compartment on the underside of the desk. I pushed up my goggles and wiggled open the drawer, expecting to find nothing more than a nest of spiders. Excitement rushed through me when I caught sight of a stack of letters tied with gold ribbon. Whose were they? The single overhead garage light was not enough illumination to do the letters justice. I plugged in the Tiffany desk lamp and switched it on. Rags nuzzled his head beneath the hem of my tattered jeans and purred: Tell me. What did I help you discover? HAVE YOU EVER DISCOVERED SOMETHING HIDDEN AND WONDERED WHO OR WHERE IT CAME FROM? DID IT EVER LEAD TO SOMETHING…DIRE? Check out my virtual blog tour via my event calendar. 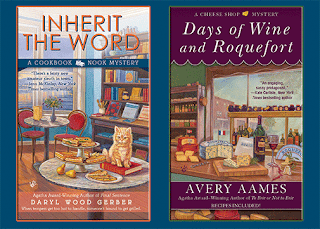 Lots of book giveaways coming up! And check out Mystery Lovers Kitchen tomorrow. There will be a book giveaway on that, too! By the way, Jenna’s author is the same as my author, except they have different names. How can that be? Well, one author’s name (mine) is a pseudonym. 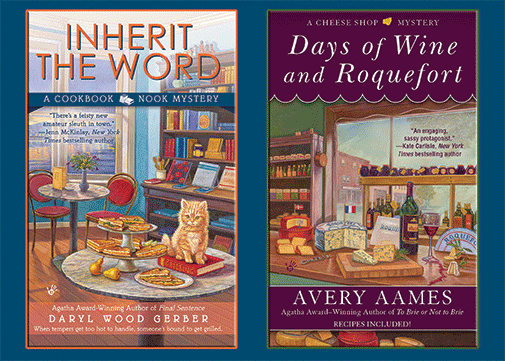 Avery Aames is fictional, like me, but she and Daryl Wood Gerber are one and the same. It stretches the imagination, doesn’t it? Clay and I dug up Snoozy Gallagher's buried loot, and the consequences were deadly. My author, Janet Bolin, wrote about it in THREAD AND BURIED.